Low inventory in high demand residential real estate markets is fueling rising home prices in Phoenix and across Arizona, a trend that won’t shift as long as demand exceeds supply according to a new report from CoreLogic’s Home Pricing Index. In its latest report, the Irvine, California-based global property information, analytics, and data provider that serves real estate markets, capital markets, and the public sector finds that Arizona home prices increased 7.4 percent year-over-year, and forecasts a 0.3 percent month-over-month increase for June. Despite rising residential home prices, consumer demand remains high. 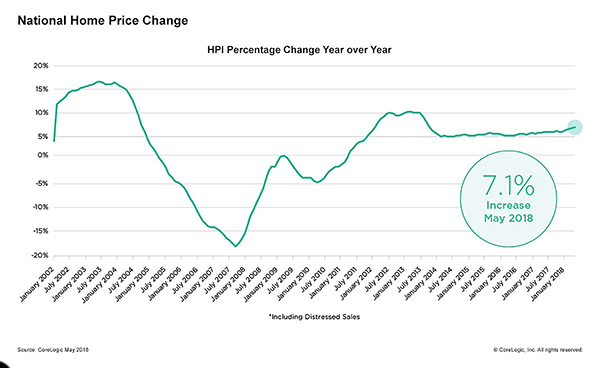 Across the U.S., CoreLogic’s Home Price Index report for May shows that home prices increased nationally 7.1 percent year-over-year and 1.1 percent month-over-month. CoreLogic President and CEO Frank Martell stated in a press release that across the U.S., 28 percent of renters are looking to buy a home, while only 11 percent of homeowners are willing to sell. Until supply catches up with demand, Martell says, prices will continue to rise. Core Logic projects that by May 2019 home prices will increase by 5.1 percent.